We can see what the power of one life can do in the person of Christ, and He accomplished more than what we feel can be done today as people use technology to further the will of the world’s ways and not further the kingdom of God. The preaching of the gospel cannot move forward if no one is telling about it as we are commanded to do as Jesus taught. (Mark 16:15-20). 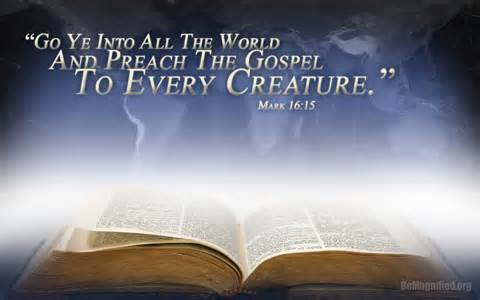 And he said unto them, Go ye into all the world, and preach the gospel to every creature. He that believeth and is baptized shall be saved; but he that believeth not shall be damned. And these signs shall follow them that believe; In my name shall they cast out devils; they shall speak with new tongues; They shall take up serpents; and if they drink any deadly thing, it shall not hurt them; they shall lay hands on the sick, and they shall recover. So then after the Lord had spoken unto them, he was received up into heaven, and sat on the right hand of God. And they went forth, and preached every where, the Lord working with them, and confirming the word with signs following. Amen. As the parable of the seed and the sower many start out strong preaching the truth they have learned yet fall away for many reasons. (Matthew 13:3-9). Paul explained so well this message as well by telling of the many things he suffered like reproach for his faith, for the narrow path is not the easiest but is the only one that leads to eternal life when endured! (2 Corinthians 11:21-27). I speak as concerning reproach, as though we had been weak. Howbeit whereinsoever any is bold, (I speak foolishly,) I am bold also. Are they Hebrews? so am I. Are they Israelites? so am I. Are they the seed of Abraham? so am I. Are they ministers of Christ? (I speak as a fool) I am more; in labours more abundant, in stripes above measure, in prisons more frequent, in deaths oft. Of the Jews five times received I forty stripes save one. Thrice was I beaten with rods, once was I stoned, thrice I suffered shipwreck, a night and a day I have been in the deep; In journeyings often, in perils of waters, in perils of robbers, in perils by mine own countrymen, in perils by the heathen, in perils in the city, in perils in the wilderness, in perils in the sea, in perils among false brethren; In weariness and painfulness, in watchings often, in hunger and thirst, in fastings often, in cold and nakedness. Joshua knew of the power of the Living God he served, and it would be many years later that Jesus taught the same message to many. (Joshua 23:8-11) But cleave unto the Lord your God, as ye have done unto this day. For the Lord hath driven out from before you great nations and strong: but as for you, no man hath been able to stand before you unto this day. One man of you shall chase a thousand: for the Lord your God, he it is that fighteth for you, as he hath promised you. Take good heed therefore unto yourselves, that ye love the Lord your God……. (Mark 11:23-24).